Combining the best of Midwestern “livability” and world-class opportunity, Valparaiso is a wonderful place for law students to study and begin their legal careers. The city of Valparaiso, with a population of 30,000, offers unique cultural, social service, and recreational opportunities. It was named 2009 Community of the Year by the Indiana Chamber of Commerce. Our community schools rank among the best in the state; public parks cover 400 acres of the city; and our proximity to Lake Michigan provides extensive opportunities for fishing, hiking, biking, and boating. Our vibrant arts scene is fueled by a community theater, several professional galleries, an art museum, and an opera house. Valparaiso shopping and restaurant offerings range from national retail chains and fast food to one-of-a-kind boutiques and fine dining establishments. 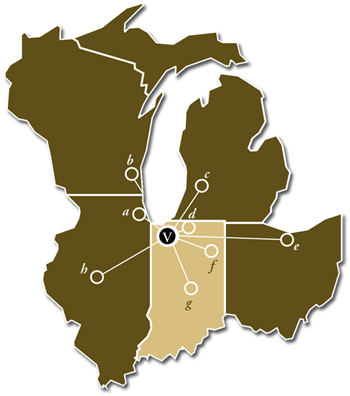 Valparaiso offers the diversity and sophistication of a Midwest university town. Because it is the county seat, the city serves as the social services hub for a wide geographic area, affording law students many externship, pro bono, and volunteer opportunities. Most city and county social service agencies are within walking distance of the Law School as is the County Courthouse. Valparaiso is 10 miles south of Lake Michigan’s beaches and one of only a few designated National Lakeshore Parks. Located in a singular ecological area of 100-foot-tall sand dunes, ponds, bogs, wetlands, and conifer forests, Valparaiso offers extensive opportunities for recreational and outdoor activities yet is only 55 miles from Chicago, the third most-populated city in the country. Chicago is home to the American Bar Association’s headquarters, as well as many of the nation’s largest law firms and corporations. Valparaiso law students have the opportunity to participate in externships, internships, and pro bono work in Chicago as well as in Indianapolis, the state capital, and other nearby cities.